Warning - pure quilty content ahead! Anyone else have a similar relationship with a TV show? Not my quilt, nor my photo, but this is a Cat themed I SPY - so it is right up my alley! I'll start with the recent history & work my way in to the planned future. On Friday night (After the false alarm...) we went to a big box "lumber yard." and ordered some kitchen cabinets. aside: If I failed to mention it earlier, my MIL (who is not alone this time) does not like our lack of storage solution in our kitchen. Since we keep Kosher in our home (Kosher style outside - we choose fish & veggie options at non-kosher restaurants) we have 5 sets of dishes, glasses, & silverware (meat daily use, dairy daily use, meat for passover, dairy for passover, & a fancy set that we used once during passover). I know other people who have many sets of dishes just because so this can't be super unusual, right? Anyway, since we only use the Passover dishes once a year for a week they live above the cabinets - wrapped up in table cloths. We are also adding cabinets to a wall that did not have any previously so that our food can be stored in a "pantry" instead of on the counters. On Saturday, we went to a Happy Fall-o-ween/Halloween party & had a nice time. (Friday nights don't work well for us...) I went dressed as a .... Pregnant woman! :o) I almost did bare foot & pregnant, but my feet were too cold. My husband went as a fan of Farve & the Bretts. (No, that will never get old!) We got a lot of "advice" on babies... & historical references... It was fun. Last night, I finished that broth & used some in a chicken soup. (Yes, I picked off all of the meat from 5lbs. of chicken wings...) The soup this time was loaded with veggies, carrots, celery, onion, parsnips, & turnips. Then my GF will arrive to help me cull the stash. That plan is not as bad as it sounds... to begin with, the sewing room is the babies room & the baby has a lot of stuff... so something has to give. Busy, busy, busy & no mention of sewing... Oh well. I hope that you are sewing at least. Mommy with her boy baby cat & her _____ baby on the way. This coming Sunday, my GF is coming over and we are going to cull my stash. In the mean time, I need to evaluate what I have & why... So that I can know what to say good bye too. Any advice is welcome & solicited - If I can find the quilt top that should be hiding in there somewhere that may become a prize for the best advice. (I rarely order/purchase kits or BOM's.) But this one mentioned Taupes, looked like it would look good over my couch, & I could actually see some Taupes in the photos. I usually buy my Taupes from Pinwheels - though I have purchased them for other sources on occasion. Imagine my suprise to find so many taupes. Not just taupes but the yarn dyed taupes... (The bottom of the picture.) When I ordered the kit, I thought, "I will switch out the border - I still will. & maybe some of the other pieces. I'm not 100% sure about switching out the other pieces - well maybe a few... While I was looking for suitable substitutes, I noticed a few stapled on price tags & you can see the prices at the pinwheels link above... But for a king sized quilt with those yarn dyed taupes, this quilt was not a bad deal... (Even though my husband choked when I told him the price.) Especially since some of those are "new to me." This is my quilt number 6 of 8 things to Finish by Thanksgiving. This is plan C for those fabrics & There are many things that I would do differently next time, but it is done & "Done is better than Perfect." The model is mid-bath (in case you can see that cute little pink tongue)... This has a minky back, so I kept it simple... It is soft & warm. & Ready for the washer once we have the washer ready for baby. They are awesome cat toys.... BTW This is Ms. I'm to big for playing, but she chased this scrunchie around for quite while. She must have had a piece of wild fur up her tush! Which would have been so much better than the hair ball that she woke me up with this morning. On Friday, I had a regularly scheduled OB appointment. While in the waiting room, I started to feel some really bad cramping. (Enough to worry the receptionist.) & Those early get your uterus ready contractions were more frequent than they had ever been before. Baby is fine, sounds great, still breech, measured 34 cm at 34 weeks which is also good. A. I had to halve the shipwreck stew recipe for my crock pot - too bad I did not know that before browning all of that meat, chopping all of those potatoes & carrots, and dumping a bag of green beans in to the pot. I hope that my halves are proportionate in stuff... Luckily while the cans were all open, I was able to dump one into the pot & the other into the bowl for cooking session number 2. I was finally able to get the meat & chicken for me weekend cooking. But I am posting this for KDL. Heck I even see pumpkin recipes - that don't assume that you get your pulp from a can! On Sunday, my mini-group (there are 14 of us including me) threw me a baby shower. S is for sheep, t is for teddy bear, U is for unicorn, x is for xylophone, y is for yo-yos. The friendship stars are in the corners - since the alphabet only has 26 letters. (I have a knack for looking goofy in most photos...) Yes, I am "that" pregnant! After the party, we went over to a girl friends house - she serged a ton of flannel into receiving blankets & is going to embroider on a few more - since they were solid. More from the Quilt Show! Some have asked... This quilt show was in Rockville/Gaithersburg, Maryland. The guild meets in Potomac, Maryland. From a guild challenge on using song lyrics. Probably my favorite from the whole show. One final challenge piece = who knew that cats could be so challenging? Last one that I am going to post - more can be seen in my flickr album. It is officially soup & crock pot season. While I made a Diet Coke chicken (recipe at the end) last night, here is a soup-er simple crock post chicken soup recipe. Night before: Cut carrots, celery and onion. Take chicken out of freezer. Set out seasonings. Have crock pot accessible. In a.m. literally throw above ingredients in crock pot and add water to cover the ingredients. Put on lid, turn on low, approximately 8 hours. Remove chicken breasts from crock pot with tongs. Cut meat on plate and return meat to soup mixture. Rinse the chicken wings. Put them in a stockpot and add enough cold water to cover by 2 inches. Bring the mixture just to a boil over high heat, skimming and discarding the surface skim with a slotted spoon. Reduce the heat to medium-low and simmer, skimming frequently, for 20 minutes. Add the onions, carrots, celery, parsley, thyme, bay leaf, and peppercorns; simmer for 2 1/2 hours. Strain the stock and skim off all the fat that rises to the surface. (Alternately, cool the stock and refrigerate it overnight. The fat will harden on top of the stock and is much easier to remove.) Return the stock to the pot and simmer until reduced by one third, about 30 minutes. Divide the stock among several resealable plastic bags and freeze it. Put it all in the crock pot I cook on low for 6-8 hours. I served it with steamed snow peas & rice. As you know I like to peruse Flickr. I also like to see other quilt shows/historic collections. Once upon a time ago, (excluding very early American History & quilt blocks named for battles, platforms, & people) I always pictured Political quilts as a product of the 1930's... This seemed to be a woman's voice in the political arena to me, or a way for a community to show support of a candidate. Like this one & Lots of political/patriotic quilts here. Political/patriotic quilt history here. Many quilts were shown at the 1933 World's Fair of a political nature, you can see two of them if you follow the links to the book available through Amazon at this site. 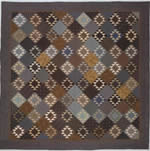 Many subjects of a historical quilt perspective can be found here. I have seen several other quilts on this same subject as of late. I don't remember seeing any quilt from the last 4 elections (since I have been paying attention to quilting). With that said, I think that I saw this at my local county fair, but it was displayed folded over a rack.... (I still liked it folded, but I am happy to see & present the whole quilt now. A gal with whom I work had a breech baby about 17 years ago. After hearing that one I had to call my insurance carrier. Officially, the doctor will not try to turn the baby. That is for the baby to do or not on its own. The insurance will pay for a planned c-section, so if the baby does not turn, I don't have to worry about pulling the baby by its legs out of the birth canal. I am not sure when that decision would be made, but I know the day on which I would choose to deliver... Thanksgiving after sunset. After dealing with infertility, we have a lot to be thankful for... Also that corresponds to Rosh Chodesh (new moon) - Rosh Chodesh symbolizes renewal, the ability of the Jewish People to rise up from oblivion and restore itself to its past greatness. Just as the moon disappears at the end of each month, but returns and grows to fullness, so Israel may suffer exile and decline, but it always renews itself. & If I deliver a boy on Thursday night/Friday day, the Brit Milah (Bris) would be on Sunday which is quite convenient for all of the people who work, but who would like to help us celebrate. a. it started a bit late (no biggie). b. some people arrived even later (no biggie). The baby is fine, but in a breech position. This will most likely move my birth plan from 100% natural to planned caesarean... But that may be speculation on my part - I see the doctor next week. Tonight we tour the maternity wing, tomorrow is our last childbirth class & Friday is our Lamaze class, so I don't have super high hopes for this being finished or anything else being worked on anytime soon. I guess this is Indian Summer & if it gets as cold as the Farmer's Almanac predicts, I'll be wishing for 80's come December/January/February - especially as I take the kitten to well baby visits... BUT I am not happy with temps. in the 80's. There I said it... I have a pet peeve about weather complaints, but I am apparently jumping on that bandwagon! This morning as my husband was taking his shower, I remained in bed with the cats - Rhapsody likes the highest perch - so she laid on top of my baby. Since this was before breakfast, she got kicked a lot! I survived the long weekend with my family & my MIL. Speaking of the cats, my grandmother reported that they were much nicer. I explained that they were on their home turf. (When I lived in Baltimore, once or twice I brought them over for a visit...) Crazy cat ladies raise you hand in the air like you just don't care! So on Sunday, my MIL leaves NY at about 5:30 in the morning & drives down to see us (the baby bump) before the arrival. This was one of the more awkward visits - she wasn't tempered by her husband - I guess... She has definate ideas about baby names - can't wait to hear her honest opinion on our choices... (We are not telling anyone yet - bad luck - much to my father's chagrin.) So we caught up at our place & most everything was fine - then she offered to get Upper kitchen cabinets for us. (We have 12 foot ceilings & standard 30 inch high cabinets. but not very many of them - as in not enough of them, so we have stuff on top of the cabinets & on the counters.) My husband meanwhile is busy with, "You need to save your money for XY&Z." To which she replied, "I haven't offered to help with XY & Z." She also offered to hire a baby nurse for the first week - still thinking about that one. But I went to a kitchen design store on Monday! A few days away & all heck breaks loose! I'll start with the good stuff. You can see it on her blog here: Doll Quilt. My MIL threatened to come down for a visit on Sunday & Monday since we have Columbus Day off. I should be more broken up, but my own father is in town & coming over for dinner with his parents tonight. That is enough family for one weekend, thankyouverymuch. Then again, if my MIL did come down, I could have gotten her husband to hang the mirror in the baby's room & some curtain rods. :o) & I could have tried out another new recipe out on her. UPDATE: She might come down alone on the train... She is allergic to onions & I cook with onions a lot & they are like corn syrup - added to a lot of prepackaged stuff! I guess I should prepare that onion free dish anyway... Or maybe we can go to that place with a salad bar - she is a big salad eater... I wonder what else might come up before I publish this post. Cut off tops of tomatoes and reserve tops. Scoop out pulp of tomatoes, chop and set aside. Place tomato shells in a baking dish. Sprinkle sugar lightly inside of tomato shells and set aside. In a deep skillet, saute onions in olive oil. Add ground beef, Worcestershire sauce, salt, pepper, allspice and mint to taste. Add the reserved chopped tomato. Cook until Tomato is soft. Add rice and combine. Spoon meat mixture into the shells and cap with the tomato caps. If there is extra filling just pack it around the tomatoes. Combine tomato sauce with olive oil and pour over the tomatoes. Cover with foil and bake at 350 degrees for 30 minutes. Remove the foil and bake and additional 30 minutes or until the shells are soft to a fork. Nothing quilty going on today, although after I run an errand or two, I hope to work on the yellow quilt. I would share photos, but I forgot to take them as I went & I had a class on breasfeeding last night, so there were no opportunitites for photography. I't will work in the end, just not "to" plan. I also worked on the Faux Log Cabin, my albatross. Now I need to cut the last logs - I thought the whole thing was cut out when I set it aside - a long time ago - nope.... Luckily the fabrics are all still together. I mentioned yesterday about going to JoAnns - I went in for bamboo batting, it was sold out. Now that I have worked on the Minky project - batting would have been over kill anyway. Not much else to report... My father will be in the area this coming weekend, not sure if he will make it to my neck of the woods or not though... (His parents are near Baltimore.) I'm gonna start cleaning/straightening/food preparation just in case. I am posting this today, because I am wondering, how many of you have made or plan to make more than one "holiday" quilt? This quilt is on my couch now for fall decoration. Not that I am a decorator... The more I think about it, no one in my family is a decorator. In all the houses I can think of, you put your stuff "up" & there you go, there was not changing for the seasons or holidays. What my cats do all day while I am at work. If you use Minky with a top, do you add batting? I am not sure if it is necessary... I plan on wrapping the wide border to the back for a self binding & finishing that on the machine. The border is 10 inches wide, I hope to end up folding it in half, so that the machine stitchig is along the seam where I attached the border. I chose 10 inches, because I thought that I was going to be able to "shirr" the two edges - ending up with a ruffley "puffy" border - I think the foot that I was sold goes to a serger, not my sewing machine... BTW This is the yellow quilt on my list. The center is a beautiful Alexander Henry bird print. Here she is again, my "new" big helper. Nothing innocent about this, you can see that she is grabbing the fabric that I wanted to sew with. This photo should have gone with Monday's post. This is the back for the RR X-ing quilt that I made for my father. It was part of my "Finish by Thanksgiving" list. Speaking of that list, I finished the hand quilting on the blue & yellow log cabin. So my list is down to about 4 items! That leaves (Is that how you spell the non-tree leaves?) Faux Log Cabin, yellow quilt, binding the doll quilt, & keeping up with the round robin. Tonight I hope to piece on that faux log cabin & attach that binding.